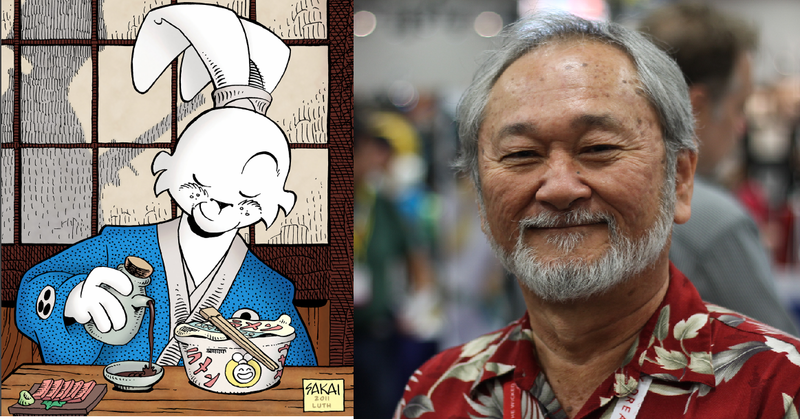 Home » COMIC BOOKS » SW Interview with Stan Sakai – on Usagi Yojimbo and inspirations. 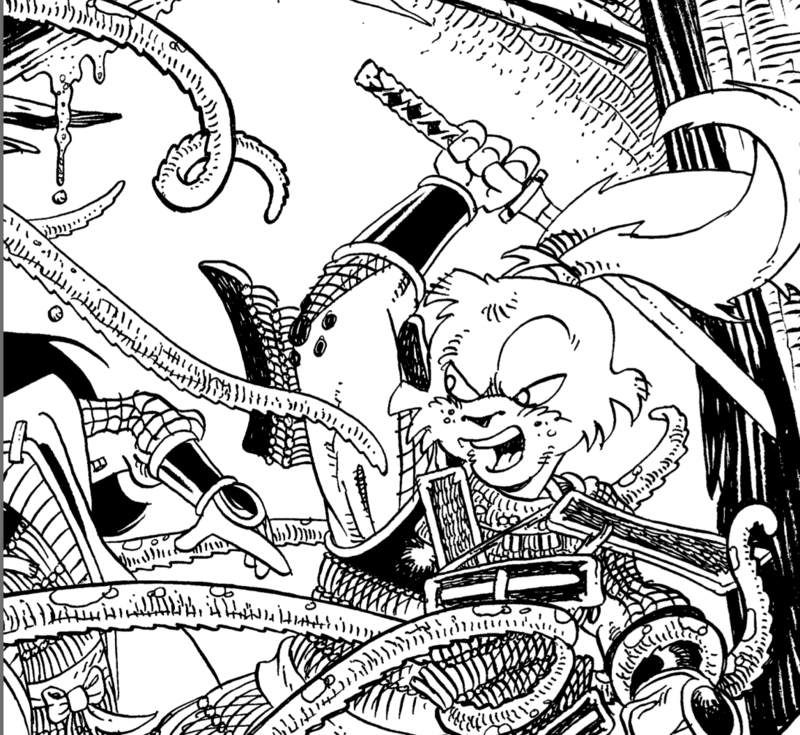 SW Interview with Stan Sakai – on Usagi Yojimbo and inspirations. 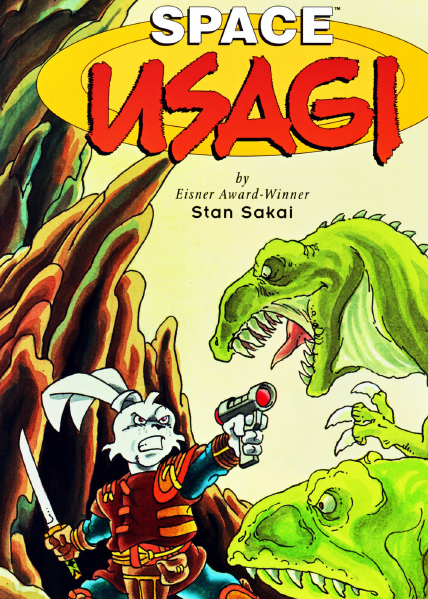 A Stranger Worlds interview with writer/artist Stan Sakai, creator of Usagi Yojimbo. We discuss our favorite samurai rabbit, science fiction, and more! Upon many bookshelves, digital readers, and mixed media; a samurai rabbit named Usagi Yojimbo lives. Through the sequential arts, he takes part in fantastic adventures and epic tales, through the wonderful work of cartoonist Stan Sakai. Stan Sakai was born in Kyoto, Japan, but raised in Hawaii. Eventually, he started his career lettering comics in the early 80s (most notably, in Groo: The Wanderer with Sergio Aragones). Soon, Stan Sakai would write and draw his own creation, Usagi Yojimbo, a series centered around the life of a samurai rabbit in an anthropomorphised historical Japan. For over 30 years, this work won multiple awards, and an international fandom. 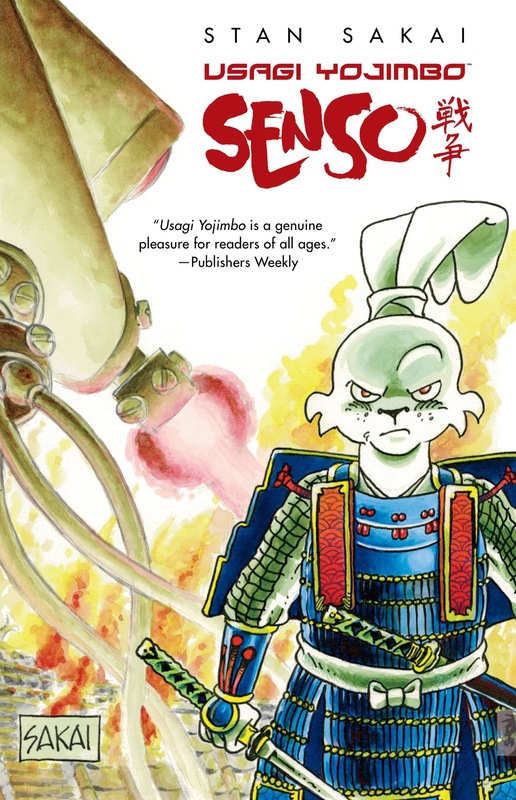 Sakai’s storytelling continues today, but with some interesting twists and takes..
His recent work as limited series, Usagi Yojimbo: Senso, brought our fighting rabbit and friends against a sudden alien invasion; familiar to H.G. Wells classic tale, War of the Worlds. This collision of two worlds brought rave reviews, and a return to science fiction storytelling since Sakai’s alternative take on his character in Space Usagi (1998). With Senso fresh in mind, I had a fantastic chat with Stan Sakai at the Dark Horse booth during the 2015 San Diego Comic Con. I was a bit excited, and wanted to learn more about his views on science fiction, travel, and inspirations; and how they all mixed with his work. We discussed these topics and much more, as detailed below in our transcript of the interview..
Hello Stan! My first question is on your recent work, Usagi Yojimbo: Senso. The series was quite different with this different challenge for the cast. I enjoyed this. Stan Sakai: Usagi Vs. Martians! Yes! That’s a very interesting concept and unexpected for many Usagi fans. I wonder, what led you to bring this story together? Stan Sakai: I started with this, maybe 15 years ago. I thought it was such a wacky idea with so much potential. I envisioned a samurai in full battle armor fighting against Martians and their Tripods, and I just thought that would be just great. Japan gets attacked by all these giant monsters anyway. So why not have the Tripods attacking and blowing up these castles. It sounded good, and I had such a good time with that. But, this story is 15 years in the future from the current Usagi and cast that we know. Is any of this considered canon, or official to the story that fans are familiar with? Is there a connection here with current Usagi and the far off Space Usagi story? Stan Sakai: Yeah..its not canon..it could be. It’s one of many possibilities.. Indeed. And, for with this time and the generation between Senso and Space Usagi..that leaves a lot of time in between for other situations for Usagi. Are there other possible settings for Usagi you considered? Perhaps a post apocalyptic tale or Blade Runner-esque Usagi, for example? Stan Sakai: I had ideas for Usagi descendants, and marked which ones seemed interesting..I was thinking 21st century investigative reporter. Also, a 1930s pulp hero,..Usagi: Shadow of the Rabbit, like The Shadow. There are others in the old west, where Usagi’s descendant goes out into the 1800s. Yes, there’s a whole bunch. That sounds exciting, as Usagi’s adventures now seem limitless. But for science fiction, whats it like for you to kind of delve into this style of fantasy writing versus the more historical writing setting for Usagi? Stan Sakai: It’s a kind of unique. I own the character so I can do anything I want with it. I can do stories about mystery, romance, adventure, all kinds.. the science fiction is just another genre that I can do. And, there is one more Space Usagi, that I would love to do. Ah, please make it happen (I loved Space Usagi). Are there are any works of science fiction you really enjoy and feel inspired by? If so, which? Stan Sakai: I was into science fiction when I was in college. I read a lot of Asimov and all the great science fiction writers of that time.. I love that genre, but then I love fantasy as well. It was also that time I discovered Lord of the Rings. Now, I am into mysteries and hard boiled detectives. Ah, I would love to see those elements brought into Usagi. Speaking of Space Usagi, are there any plans to rerelease those series into some new collected edition? Stan Sakai: Yes, yes! Actually Dark Horse has been issuing series of Omnibus Editions as the Usagi Yojimbo Saga. It’s like three trade paperbacks in one big volume for the price of one and a half. The omnibus editions of the Usagi books are about 600 pages, so there is a lot of stuff in there. 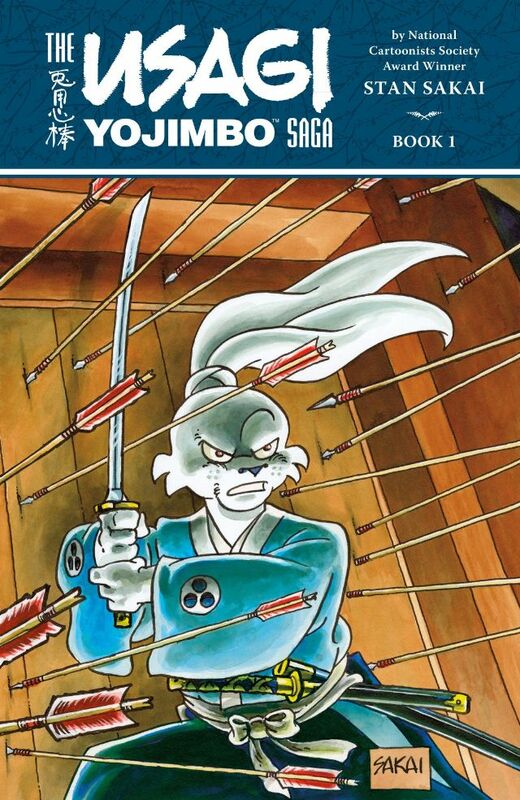 So, Space Usagi and few others that don’t fit into the regular Usagi Yojimbo universe will be put into one fat book. Good to check out, especially for new generations! So, I am a travel nut and love inspirational destinations inspired by fiction. 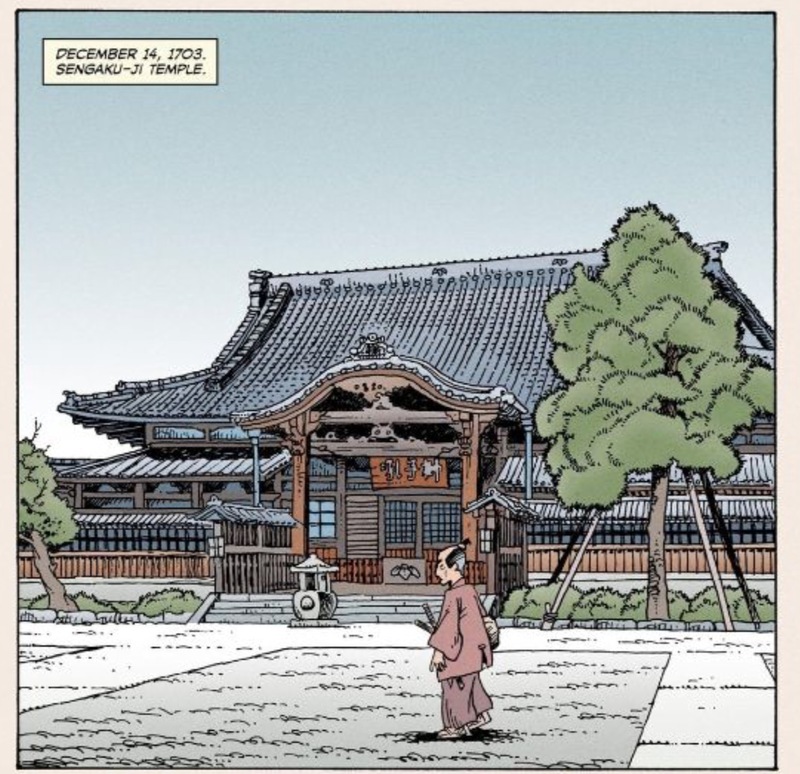 The regular Usagi comics has some great historical settings and imagery that takes you back. But I am curious, do you travel? And have you visited Japan and found places to use in your backdrops for the Usagi comics? Stan Sakai: Oh yeah, in fact when I did 47 Ronin, all the scenes I did of the Sengaku-ji Temple, where they are all buried, are taken from my photographs. Stan Sakai: Yes, also a tax write-off (laughs)! Stan Sakai: I do have two kids. What’s it like for them to have a famous cartoonist for a dad? Does your work inspire them to follow a similar creative path? Stan Sakai: Hannah has been asked that, and she says I don’t know…because she doesn’t know anything other than having a cartoonist for a dad (laughs). As far she knows, all other dads work at home and watch TV, so its kind of hard to answer that..
For my last question, as to Usagi for future generations.. What do you expect for new readers to take in when discovering your works? Perhaps a message now, a sort of time capsule should this interview be found in a Space Usagi time..
Stan Sakai: A mother told me she was talking to her son about Usagi., and she said, he was reading this adventure story. The son said no, it’s a story about honor. That really surprised her, as that is something I would like to convey. That made me feel good that she told me that. That’s a nice thing for kids to pick up on, not so much historic but lessons about honor. Usagi Yojimbo: Senso and the Usagi Yojimbo Saga omnibus volumes are out now on the shelves of better retail bookstores and comic stores everywhere, from Dark Horse Publishing. For more info, visit the official site at usagiyojimbo.com and darkhorse.com. For more on Stan Sakai’s, check out his official site at stansakai.com. *Stan Sakai said a few names of places I think, but couldn’t quite make them out in the recording. My apologies to the audience and Stan Sakai on this. 5 Comments on SW Interview with Stan Sakai – on Usagi Yojimbo and inspirations. Thanks for checking out. It was a real honor meeting and talking with this man…and proud to share! I am so freaking jealous right now, you have no idea. I officially hate you, sir.